Sophisticated biomechanical design, adjustable seat height, multifunctional handles, realistic seat-to-pedal alignment, LED display. 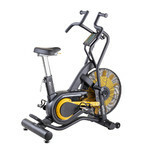 The Exercise Bike TechnoGym Excite Bike Advanced LED is a professional bicycle simulator. Its biomechanical and ergonomic design enables you to ride in as many as three different training positions – standard, race and urban bike. This was made possible by the specially shaped, multifunctional handles and adjustable seat height. Since the mechanism for adjusting the seat’s height is at the back of the seat, you can do it while seated. The 12.5mm/0.5” step guarantees the finest adjustment of your seat. Moreover, the seat is gel-filled and thus provides maximum comfort. The bike’s wider pedals provide greater stability and support. The straps can be easily adjusted by simply tightening and releasing the buckle. The 10 degree pedal incline toward the ground makes it easier to slide the feet inside the pedals from a seated position. 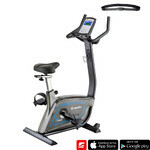 Thanks to the reduced distance between pedals and the optimum seat-to-pedal alignment, the Exercise Bike TechnoGym Excite Bike Advanced LED offers a more realistic cycling experience. 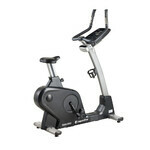 Built into the handles, the buttons for resistance adjustment allow you to fully focus on your exercise. Also built into the handles are heart rate sensors which help you keep track of your heart rate during the workout. Therefore, you can make full use of the HRC program which automatically adjusts resistance to help you stay in the required heart rate zone. 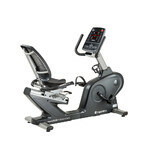 Moreover, the Exercise Bike TechnoGym Excite Bike Advanced LED can also be paired with a chest strap. With its many programs and 180kg weight limit, the Exercise Bike TechnoGym Excite Bike Advanced LED provides a professional workout experience. Why Exercise with an Exercise Bike? How to Exercise with an Exercise Bike?